August 1921 saw the erection of a new Flagstaff on Clifftown Parade. First trams enter Warrior Square as the tracks expand. The last fleet of trams, fully roofed, purchased by the Corporation. The High Street suffers with flood damage on 1st Nov 1921. Victory Sports Ground Opens - To honour the sportsmen of the Borough who gave their lives during the Great War, the Victory Sports Ground in Sutton Road was formally opened. A set of ornate gates to the ground were also installed. Presented by honorary Freeman RA Jones. Agricultural Training - Post war the government provided schemes to help veterans of the last campaign develop new skills and provide for their families. The aerodrome was particularly pulled into service with land taken to provide agricultural training , with pig pens and chicken coops. A significant number of trainees some being amputees were housed in red bricked cottages close to the St Laurence Church. 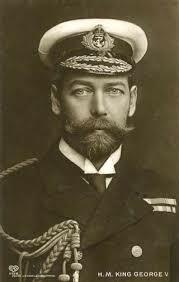 King George V raced “Britannia” in the first Southend Yachting Week, held in 1921. This fact resulted in a large number of entries and the King won the race. His visit to the town was welcomed by thousands of people who lined Victoria Circus and the High Street to get a glimpse of their King. Leigh Offices Opened - A stirring occured on 29th May 1921 in Elm Road when the Leigh UrbanDistrict Offices were formally opened. Memorial - Shoebury War Memorial unveiled in front of the Palace Cinema in Ness Road. Co-op Bakery Arrives - Co-operative societies were alive and well in Southend. Sutton Road saw the opening of the Bakery and biscuit factory in 1921.